Cohort robadr has found and posted one of the more uncommon Chevys of the era when they were so overwhlmingly common. Unfortunately, my Encyclopedia does not break out Chevy production by body style, but I’m going to guess that the Sport Sedan, a four door hardtop, was the least built of all of them. Whereas the Bel Air had started out in 1950 as the first Chevrolet hardtop coupe and the first in its field, and then went on to be the top-tier line, by 1959 its role was usurped by a full line of Impala models. 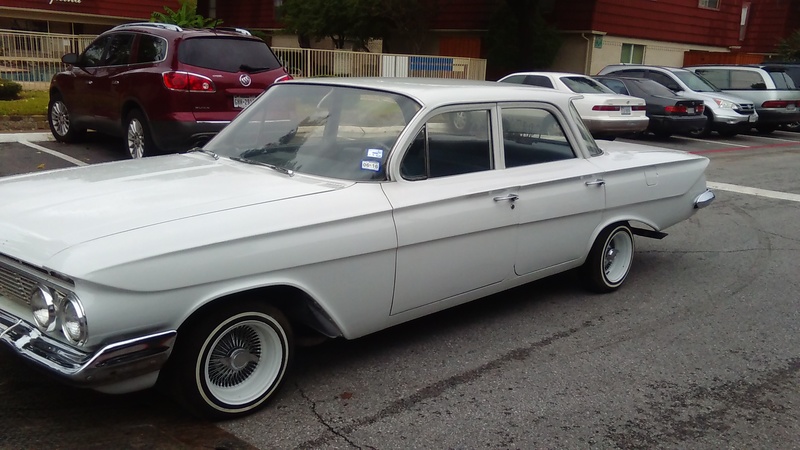 This 1961 was the last of the four door hardtops, and 1962 would be the last two-door hardtops. The Bel Air was well on its way to becoming a dowdy sedan-only line for cheapskates. It’s not really readily apparent that this Bel Air is playing second fiddle to the Impala, as it’s well equipped, including non-original wheel covers. In act, the differences in the external trim between the Impala and Bel Air are probably less on these 1961 models than any other year. The side-sweep trim is very similar, and both have some white accent. Given that the hardtops inherently had chrome trim on its windows, as well as on the roof surrounding the windows, from a distance it would be easy to mistake this Bel Air for an Impala. The more typical Bel Air looked like this, a sedan with dog dish hub caps, and the quite different “flying wing” roof line. 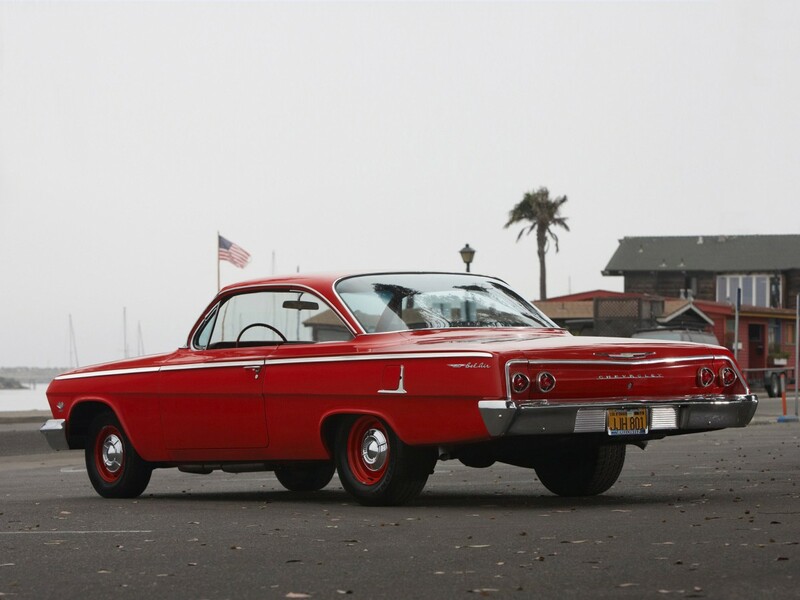 As relatively uncommon as the 1961 Bel Air four door hardtop was/is, the real odd-duck 1961 Chevrolet was the two-door sedan, the only year that the Impala was ever available in that body style. I remember seeing one in Iowa City as a kid, and being almost startled by it. What the…? Since the 1961 Impala SS package was available on any of the Impala body styles, let’s consider how rare a 1961 Impala SS two-door sedan would be, never mind the four door hardtop, which was chosen for the brochure. 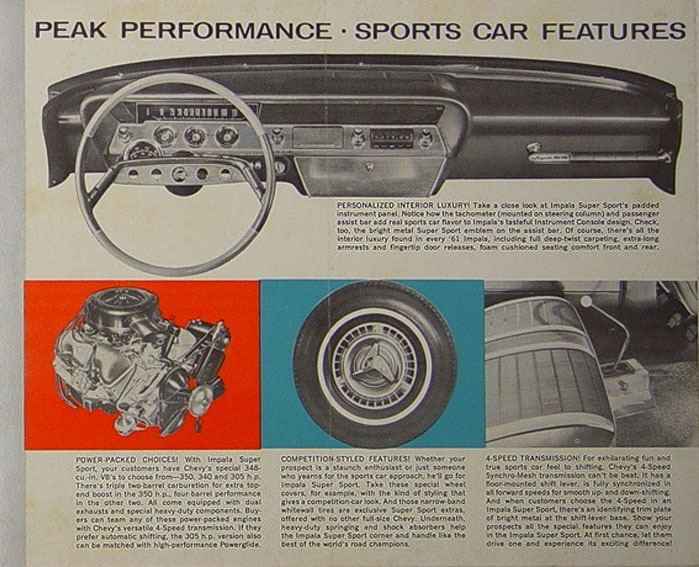 The 1961 SS package was quite different than subsequent SS packages/models, as it included all of the most serious high performance components available that year, including four speed stick shift, heavy duty suspension, sintered-metallic brakes, and special heavy-duty 8.00 x 14 tires. And of course under the hood, only large block V8s: three versions of the 348, and in the spring of 1962, the legendary 409 joined the line-up. Perhaps oddly, bucket seats were not part of the brief, as buckets just weren’t yet available on the full-size Chevrolets in 1961. That would come in 1962, when buckets were standard, but everything else genuinely sporty or performance oriented were dropped from the SS package and relegated to the option list. Even the six cylinder was now standard, along with the 283 V8. Appearance trumped function. 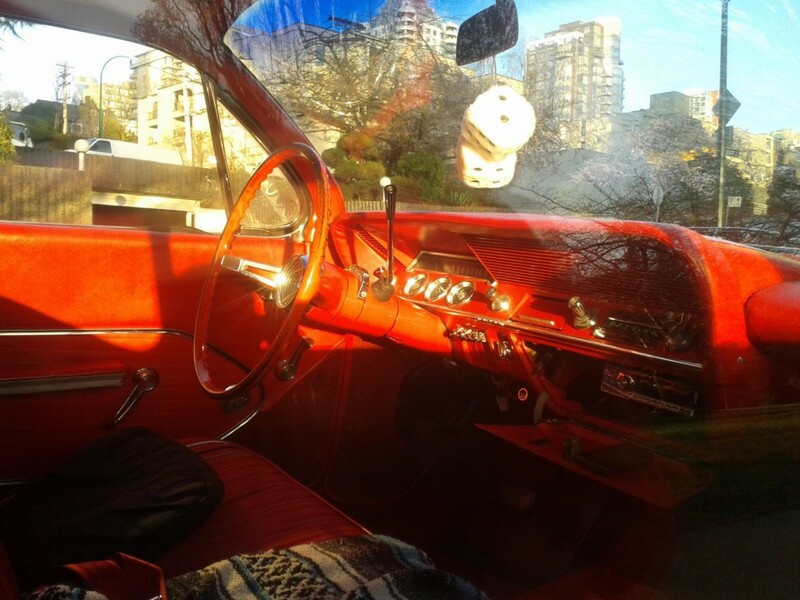 The Bel Air interior was also a bit less spiffy than the Impala’s, but hardly a penalty box, for the times. In fact, I rather like the more honest design of the Bel Air steering wheel over the rather overdone Impala wheel. This Bel Air is undoubtedly sporting the most common powertrain: the 283 V8 teamed with the Powerglide automatic. They got the job done, and the small block V8 did the bets it could in compensation for the PG’s two speeds by revving a bit more readily than the typical engines of the time. The 1961 Chevy sported new styling, along with all the ’61 GM full-sized cars, reflecting Bill Mitchell’s new leadership and a tacit acknowledgement that GM—along with the rest of the industry—had gone to far with the longer-lower-wider mantra. Thius whole exercise would of course be repeated in 1977, but then dieting is notoriously hard, to stick to, in any case. The ’61’s were trimmer, lighter, and quite appealing cars, perhaps the best of this generation (1961-1964), although some might argue for the 1963. The Bel Air was destined for a more modest future, especially after the 1965.5 Caprice appeared. The 1962 Bel Air two door hardtop was the last hurrah for the bubble-top body style, while the Impala coupe wore the new convertible-look hardtop. After that, it was all sedans and wagons. The Bel Air, which ushered in the hardtop coupe style for Chevrolet, was pushed down the ladder. But the Bel Air hardtops went out in style. I am most amazed b the fact that htis car has so much of Chevrolet Corvair styling, the low waistline, the floating roof, the more sober industrial looking trim. This was the USA really saying good bye to the overwelming fifties styling of fins, chrome, hughe bumpers and grills that could eat a kid ! There is still more form than function. But you can feel that trend towards function determines form. This is a very endearing style. Nice,a high point in US car design. The real start of the Sixties? A nice looking car, esp. in the red. A good looking car. This style really did signal the end of fins,gobs of chrome and two tone paint. My dad’s first new car was a 1991 Biscayne with 235 Stovebolt and 3 on the tree. It is interesting how many British Columbia cars are making in to CC. There are many here, since the climate is so mild. Maybe in your part of BC…. It’s true though Vancouver and the South Island have a lot of nice old cars, and it’s nice to see them turn up on the pages of CC. Nice old cars in the early spring is one of the things I miss about living in that part of the province. We’re 2 months away at least here in the Rockies! Well, Sir, your part of British Columbia is stunningly pretty all year long. I never get tired of the majesty of the Rocky Mountains. We try to get there every year. The next time we are your way, we’d love to stop for coffee! As long as you don’t mind ferocious lap dogs…. 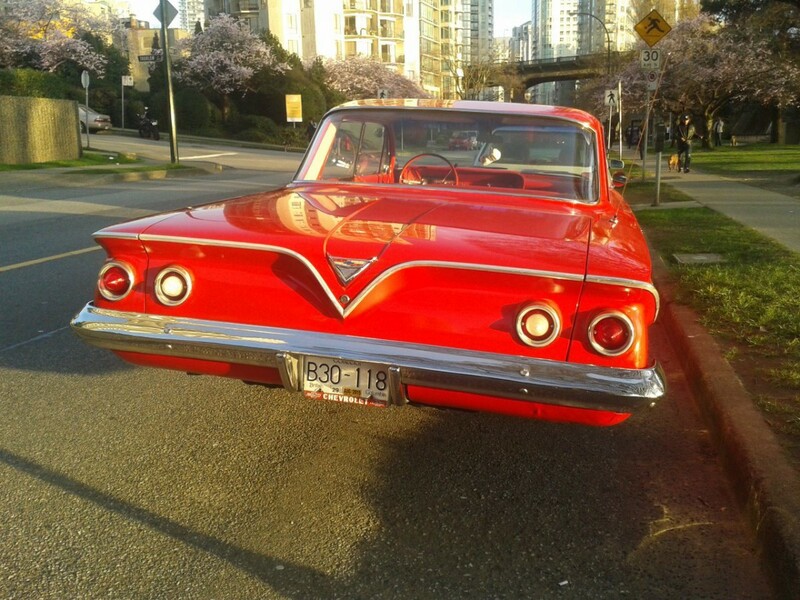 Nice find, the unseasonably warm and dry weather here has brought the classics out early in Vancouver! I really miss four door hardtops. They made any sedan look more sporty. I wonder what they were like in car washes though? Dad had a ’69 Ford Galaxie hardtop 4-dr when I was growing up in the early-mid ’70s. It always leaked a little bit when going thru the carwash. I miss that car – avocado green with a white vinyl top and white vinyl interior with black carpeting. So comfy and roomy to ride in. I’ve seen this car a couple of times over the past few weeks. The owner showed up while I was taking the pictures, and he confirmed that he’s had the car out much earlier and more often this ‘winter’. 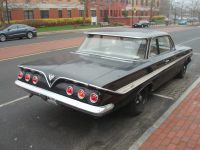 This car is yet another example where a strong case could be made that 1961 was one of the years when GM was unquestionably the leader in domestic automotive styling. Nice find, I didn’t know there even was a Bel Air 4 door hardtop in ’61. Even when I was a young guy the only ’61s you ever saw were Bel Air or Biscayne sedans. I looked hard for a nice Impala bubble top in the late ’70s/early ’80s with no success and never saw one of these. If the badging can be believed, this is a 348 equipped car. The grille badge differed according to what was under the hood on the ’59-’61 cars and crossed flags meant a 348. A Chevy bowtie with a V under it meant 283 and just the bowtie meant it was 6. All this stuff can be had in reproduced form today so it’s hard to say if this car is a real 348. Nice car anyway, and it’ll sure stand out in Vancouver sea of BMWs! Your right about the 348 Chevys having crossed flags on the grill, but they also had them on the trunk inside the V emblem. The weird thing about the featured red 4 door is that it had the crossed flags on the grill, but not the trunk. Anyway, the ’61 was my favorite of the GM full sizers of the ’60’s. Quite a departure from 1960. Trimmer and well-proportioned with nary a fin or dogleg windshield in sight. Bill Mitchell emerging from the shadow of Harley Earl. The ’61 has always been my favorite Chevy of this era. Pretty thin on the ground, though, even in salt-free Phoenix. Top of the GMH range for Australia in its day and new for 62 Chevs finally had a V8 motor in that market, trim levels fell below the locally produced Holden premier but size must have sold a few and that 283 must have helped. No pillarless hard tops though just 4 door sedans were locally assembled. 1) Those wheel covers on the ’61 Bel Air look, to these ’60s car loving eyes, like they came from a ’65 Impala. A more proficient Chevrolet expert can probably confirm or correct. I believe this is wrong. When the downsized ’77 Chevrolet appeared the (very attractive) two door was in fact a sedan. It had a fixed “B” pillar and fully framed door windows and to my understanding that body is clearly a two door sedan. That’s a semantic issue. I define “two door sedan” as a body style that is largely/essentially the same (roof line, etc.) as a four door sedan, except for having two doors. The ’77 up B-Body coupes were true “coupes”, with a distinctive roof line, C-Pillar, rear window, etc. They are what I call a “pillared coupe” in comparison to a “hardtop coupe”. Chevy killed the full-size two door sedan for all trims by ’71, a year that saw a generational change. I know it was still around for ’69, but I’m not sure about the essentially similar ’70. The only way to continue offering a two door Bel-Air was to upgrade it to the hardtop body. 1969 was the last year for the two-door pillared sedan. That had been the only two-door body style offered in the Biscayne and Bel Air lines; from 1970 on, the Biscayne and Bel Air came in four-door form only, at least in the U.S.
As Stephane alluded to above, GM Canada continued to offer two-door Bel Airs after 1969, first as hardtop coupes, later as pillared coupes. I don’t know if the two-door hardtop had been offered alongside the two-door pillared sedan all along, or if was re-introduced in 1970 as a replacement for the two-door pillared sedan. I suspect the latter. Like Justice Potter Stewart writing about obscenity: “I know it when I see it”. A ’77 Impala “coupe” is a two door sedan. If it has a “B” pillar, two doors and door window surrounds it can not be anything other than a two door sedan – but I agree that it can also be a “coupe”. I know what ya mean. From ’59 to ’69, ’61 was the only year they offered the Biscayne/Bel Air type 2 door sedan with Impala trim. The original ’58 Impala hardtop had a completely different body than the Bel Air hardtop. From ’59 to ’69, there were Biscayne and Bel Air 2 door sedans with the same roof as the 4 door sedan. All 2 door Impalas were pillarless hardtops. (Except ’61). Two door sedans were dropped for ’70. All ’70-’73 two door big Chevies were pillarless hardtops. The ’74-76 Custom Coupes had b-pillars, but they were a different animal, not two door sedans. From ’77 on, the two-doors all had b-pillars and full window frames. These cars could be called 2 door sedans. I’d call ’em coupes, since they had a different/sportier roofline than the 4 door sedans. One of my uncles, a farmer, said he wanted to buy the cheapest Chevy he could in 1961. Skipped the Corvair and would up with a Biscayne, 6 cyl, 3 speed, and absolutely no options (unless the heater was optional in 61). The car lasted for several years which is amazing as it had a tough life being driven across pastures and even into plowed fields. No telling how many times it got stuck and had to have a tractor to pull it out. I think it was replaced with a Chevy truck in 1965 or so which was much better suited to the job. The same car my father bought! Always thought the 62 2 door “bubble top” hardtop was a beautiful transitional styled car but this 61 4 door hardtop is wonderful-I agree with rudiger – inspired styling …GM at the top of their game and looking so so confident. Long time lurker here. My Mom’s Stepfather had one of these. Growing up in the ’60’s that was the only one I ever saw. His was a 6 cylinder with 3 on the tree. All white with a gray or blue interior (it was so long ago). He traded it in for a new Pontiac Catalina in 1973. His old Chevy went to the local John Deere dealer. They painted it John Deere green with a John Deere gold top. Last I saw of it. Beautiful car. They actually make nice daily drivers, even with all it’s X-frame flex. We can agree to disagree. Although they are certainly reliable and have great parts availability, I cannot think of a 1960s car that is less pleasant to drive than a 1961-64 big Chevy. Attractive, though. Great find. I’m not such a fan of the early 60s Chevs, but there is something very neat about the way that side detailing wraps around the rear. I prefer the flying roof, even if it’s pillared. I learn something new every day…..If I had looked at the pictures without reading the text, I would have thought that it was an Impala…not a Belair….never knew a 4 door hardtop existed in a 60’s Belair…. I also never knew the ’61 Bel Air could be had as a 4-door hardtop. Beautiful car, and I find the ’61s to be the most attractive Chevys of the 1961-64 time frame, and much better than the 1958-60 models. 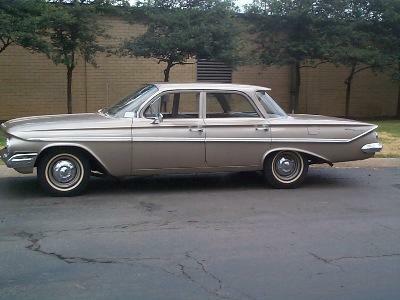 Our family had a Bel Air 2-door sedan similar to the light brown 4-door pictured. Ours was turquoise with dogdish hubcaps and a few options, including “deluxe” heater (4 levers instead of two), left hand outside rear view mirror, and back-up lights. No radio though, just a block-off plate. I remember carrying my little transistor radio with me in the car for music! The X-frame made its presence known by a very large center hump in the rear floor area. 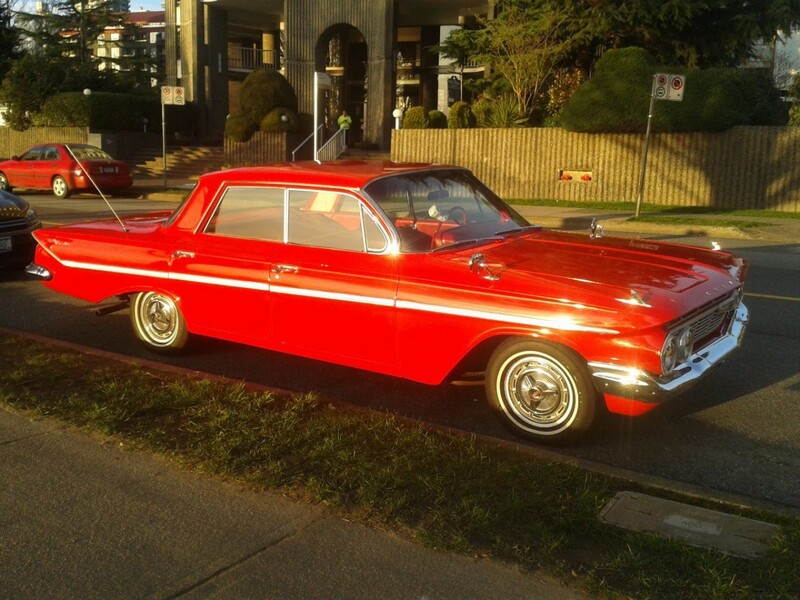 What a find-I have never seen a four-door Bel-Air hardtop before, this is certainly something new to me. 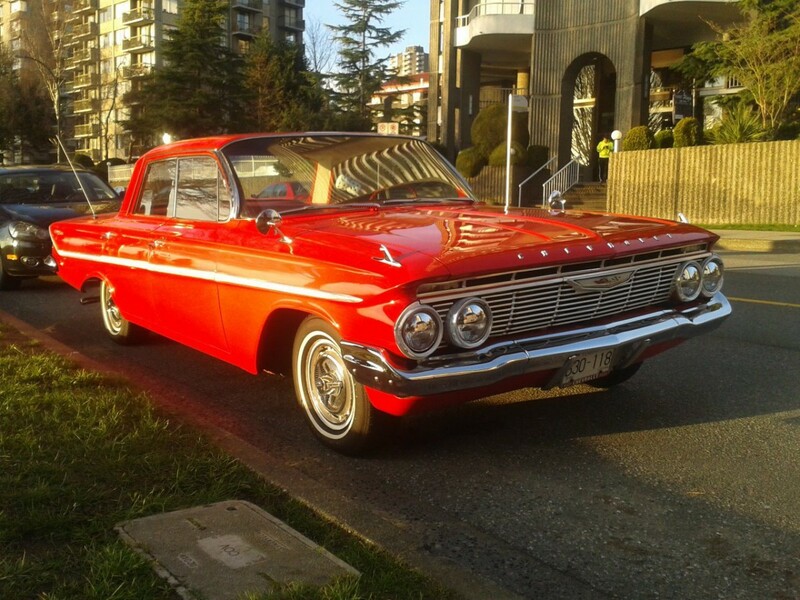 I really like the ’61’s styling, personally I think it’s the best looking Impala built. I remember seeing a few ’62 Bel-Air hardtops, I certainly liked the bubble roof hardtop better than the more formal hardtop that appeared in 1962. The ’61 and ’62 Chevrolet seemed to be gone and forgotten for a long time. The tri-fives and the ’63-’64 seemed to cast a shadow that these could not get out from under. This probably didn’t help survival rates when these were ordinary used cars. 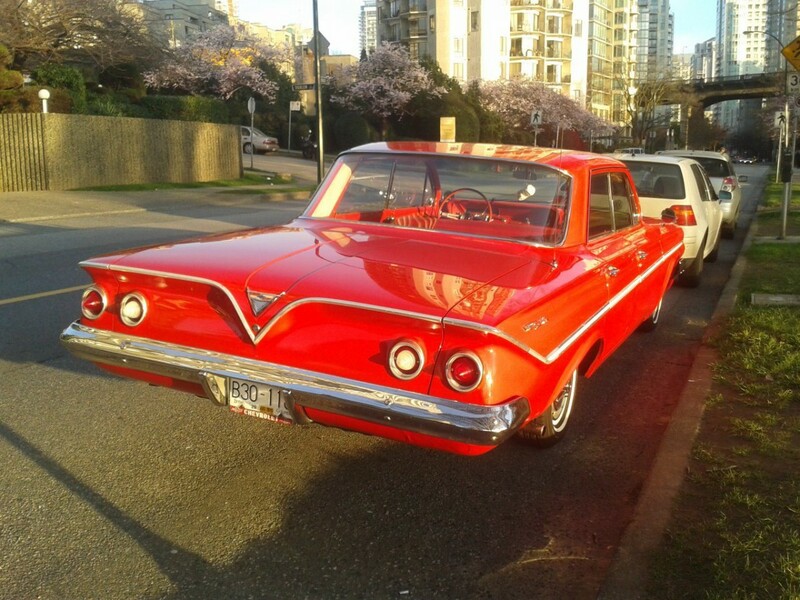 Our neighbors had a ’61 four dour hardtop Impala when we moved in next door in 1969. It was gone pretty fast, probably by ’71 or so. It was a hand-me-down kid car and pretty ratty by that time. After that was gone, I just don’t recall seeing any ’61s on the road – maybe they were a bit too plain for my tastes at the time and I didn’t pay attention. I really came to appreciate the ’61 after it was about 30 years old. As a kid, I appreciated much flasher cars, and later came to appreciate the simplicity of this design. Some of the ’61 GM cars missed the mark with awkward lines (Pontiac), an ugly ’60 inspired rear end (Cadillac, much improved for ’62), or just a bit of weirdness (Oldsmobile). Chevrolet and Buick did the best job of nailing this generation body on the first try. Spring’62 my Dad special-ordered a 1962 Chevrolet Impala four door hardtop with an I6, M3, no radio, no air-conditioning, but otherwise all Impala inside&outside trim. Yes: I6. Yes: M3. He drove it until replacing it in ’66 or ’67 with an Impala coupe. From that point he began to work his way up the GMC model tree, and his last decades’ wheels was a sequence of four Cadillacs. 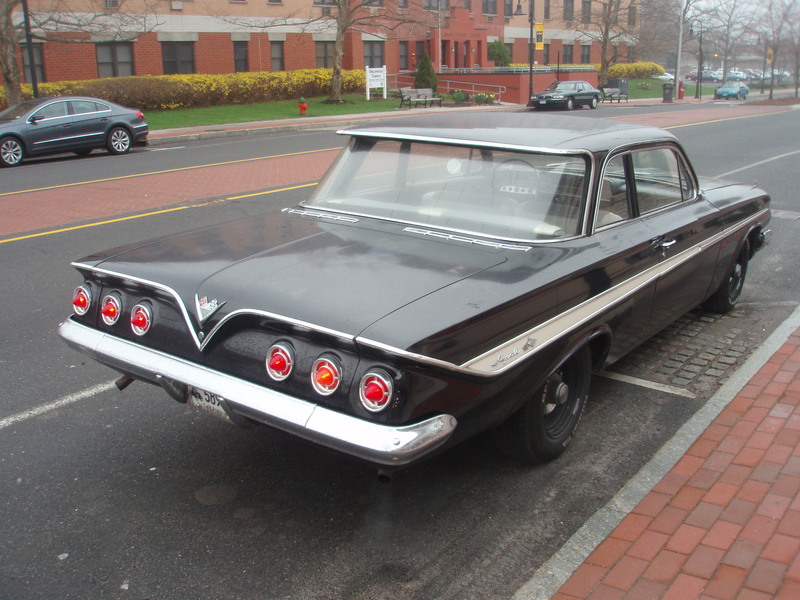 This Impala’62 purchase does illustrate how model orders could be so very individually tailored now a half-century back. I’ve written here before about my uncle’s special ordered 66 Impala four door sedan. Radio as the only option. Blackwalls, dog dish caps, 6 and three on the tree. It was his third new Chevy so equipped – 60 Biscayne, 63 Bel Air (a special order) and finally the Impala. The dealer insisted on a substantial deposit lest he be stuck with this car with no buyers. Given the number of conservative midwestern folks who lowballed car orders in those days, I’m not so sure that someone would not have picked it up. We had lots of neighbors with big Chevies with the inline 6. Uncle kept the Impala for ten years until he finally bought a moderately well equipped Monte Carlo (A/C but manual windows). 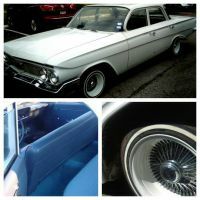 I drove the Impala many times as a teen when I washed it for him and I remember that the six was a pretty smooth and reasonably torquey engine especially when not encumbered with P/S, A/C, etc. Very different era of car buying preferences and expectations. When these cars were built, there were small new car dealerships everywhere, many were nothing more than converted gas stations. Many did not keep an inventory of cars available for immediate sale. The standard practice was to order your car to your choice of options and about six weeks later your car would arrive at the dealership. The last car my parents ordered was a 72 Chevy Kingswood wagon. After that, it was just buying from dealer stock. Which pretty much killed the mom and pop type dealerships. The last small dealership I remember was in Hardeeville SC. It existed until the mid 1980s. The building is now an antique shop. Televisions were commonly sold in a similar manner. One would order from a TV and radio sales and service shop, when your tv arrived, a tech would deliver and set up the the tv and antenna. There may be a few TV and radio shops still around, but the big box retailers and internet are rendering them obsolete. The Ford dealer a block from our house was tiny, nearly the last of its breed in a Los Angeles suburb in the late 1960’s. The fullsize Chevrolet four-door hardtop continued to be built until 1976. 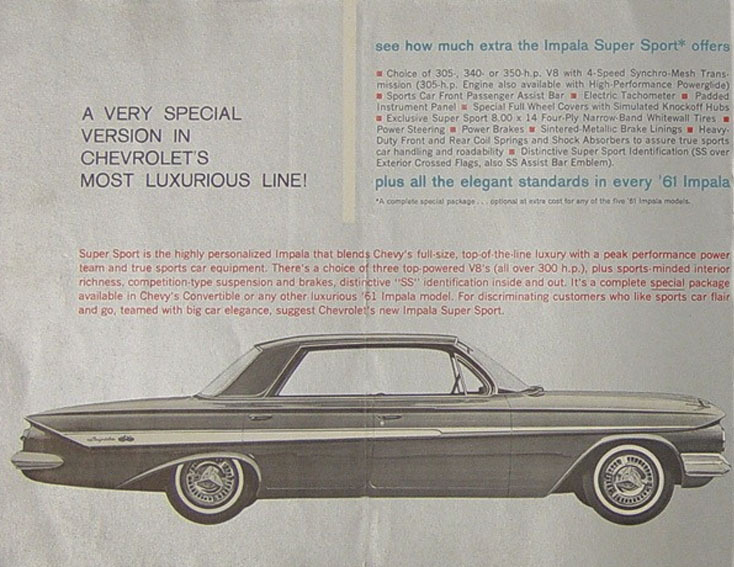 From 1962 onward, it was available only in the Impala line, and later in the Caprice line as well. The Impala always offered it alongside a four-door pillared sedan (which was probably the more popular of the two). IIRC, the Caprice came only as a hardtop (no pillared sedan) from the time it was introduced until 1972, then offered both versions from 1973-76. Saw this curbside ’61 Impala 2dr. post sedan a couple of years ago and had to stop to photo it. I had never seen one before and while gawking at it the owner came out and told me it was for real but I didn’t believe him until reading this article. For me these say “The first modern looking car”. They still look appealing. I will echo several others in that I had no idea that Chevy ever made a Bel Air 4 door hardtop that year. For my money, the 61 is a mite fussy, while the full-Bill Mitchell 62 was much more elegant. It’s funny, when I was a kid in the 60s, the 62-64 Chevy was everywhere, but the 61s were nearly invisible. The ones we did see were all painted that metallic dirt color and had no shine left. They were all 2 and 4 door sedans with rusty front fender eyebrows and mangled valences under the bumpers. Wasn’t there a mild recession in 1961, which lowered car sales? Which would answer why the 61’s seem rare, as some stated. These were fine looking cars even in base form-I’m just over 50 but I’ve talked to a lot of older guys who bought new cars off dealer lots not realizing they could custom order what they wanted, or the dealer made a trade with another to make sure the sale happened. The last attractively styled full sized Chevy until the 1965 model. 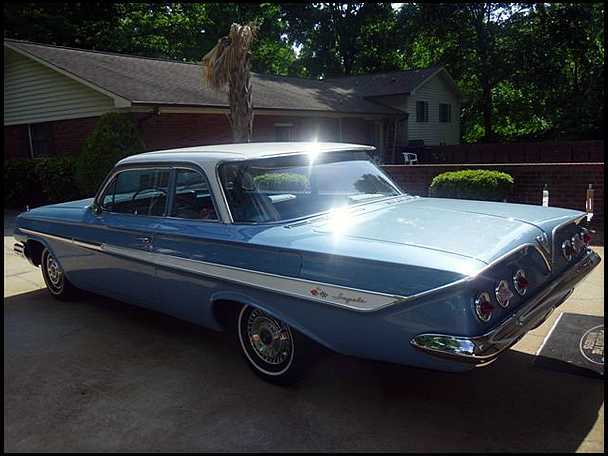 I had a sea foam blue and white 1961 Impala Super Sport four dour coupe/sedan just like the brochure picture. Bought it from the original owner around 1983 with only 26,000 miles, completely original including tires and plastic protective seat covers, order sheet, window sticker, the works. Great car, had to sell during hard times and it was chopped up by the next owner into an ugly hot rod. I like the way they spun the cancellation of the 2 door wagon by using the phrase “all with 4-door convenience”. I have the four door 61 bel air hardtop and am loving it! WOW! Great article! I have the blue and white 61 Bel Air (shown in the advertisement) sitting in my garage. It was my high school graduation gift from my uncle and aunt who were the original owners. It has a 348 Turbo Glide and an automatic transmission. Now that I’m 60 it needs to be passed on to a new owner. Any suggestions about how I could determine the value?